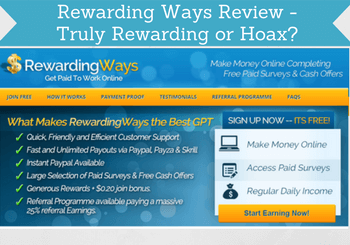 Rewarding Ways Review – Truly Rewarding or Hoax? 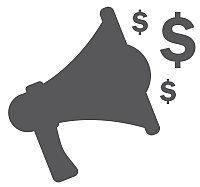 Rewarding Ways claims to be a way to make money online by taking surveys and cash offers. But is it Rewarding Ways scam site that is a waste of time or can it truly be rewarding to join? I have been a member of the site for a while myself and have tested it thoroughly. In this detailed Rewarding Ways review, I will give you all the details, about what it offers so you can judge for yourself and find out if it is a site for you or not. What is Rewarding Ways and what does the site offer? Rewarding ways is owned by 99 Ventures which is a UK based company that offers worldwide online advertising and owns and runs several get-paid-to (GPT) sites. It is, for example, the same company that owns Superpay.me, which I have previously reviewed. As a member of both of these sites, it is clear to see that the owners are the same, as they in many ways are built in the same ways and offer many of the same options. There are however also some differences. Both sites can be a bit confusing to use in the beginning and do not have great usability, but luckily it does not take too long to figure out how to use either of them. If you like doing paid surveys, Rewarding Ways has a lot of offers. It is one of the best ways to earn on the platform. All the surveys are offered through what is called third-party providers, which means that you will be offered surveys through a number of Rewarding Ways’ partners and not the site itself. This is also fine and many sites are using third-party providers, and it can give a lot of different offers. Examples of surveys on Rewarding Ways. You just have to be aware that when you take surveys through survey providers like this, you in many cases how to fill out some basic information about yourself the first time you take a survey through a provider. It can be a bit annoying, but just be aware that in most cases it is only the first time you use the provider through Rewarding Ways you have to do this, so after you have done it once, you do not have to do it again. And the advantage of a site like Rewarding Ways is that it has A LOT of survey partners so you can find a lot of opportunities here. You will, as on all other survey sites, not qualify for all the surveys there. So do not be discouraged if there are many you do not qualify for – it is perfectly normal and there will also be many you do qualify for. You can watch small videos and earn a small reward by doing this on Rewarding Ways. It can be all kinds of different small entertaining videos or ads and there are a lot of them available. There are many video options – it is, however, not the option with the highest rewards. I rarely use this option myself on any of the GPT sites that offer this, as the rewards are very small for this. But if you like to watch entertaining small videos, it can be fun to get a little money for it at the same time. And the advantage is that it has more or less unlimited videos you can watch and you can earn this way no matter where you live. 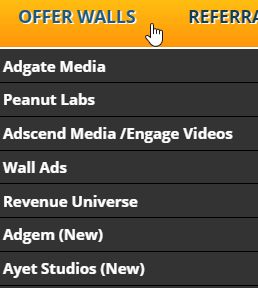 If you have ever used a GPT or survey site before, you will know that many of them have an offer wall. This is where you can take different online offers. It can, for example, be to sign up for a trial for a product or website, sign up for newsletters, download an app and more. Rewarding Ways has many of these walls available. Some of the many available offer walls on Rewarding Ways. Some of them can give really good rewards, but many are also not worth it, in my opinion. So be sure to check the exact conditions before you take any of these offers. Many of the offers on Rewarding Ways are the same as other sites like for example ClixSense has. The rewards for the offers will be more or less the same no matter which of these sites you are taking them on. So which site is the best to take them depends a lot on which site you prefer overall, and which site has the payout methods you prefer. But the offer walls are definitely worth checking out. If you read the conditions and find the right offers, you can earn some really great rewards here. Often you can also find extra paid surveys on the offer walls. You can sometimes get a promo code for Rewarding Ways which can give you a small free reward. The way to get a promo code is by keeping an eye on Rewarding Ways’ social media accounts. Once in a while, a promo code will be posted here. If you see one of the promo codes, you then put it into the promo code field when you are logged into Rewarding Ways. You can get free money with the promo codes. In my experience, it is, however, not very often they will post a promo code, so do not count on it to be a way to make big money. In general, the rewards for this are not huge but compared to other sites that offer promo codes, the rewards are decent on Rewarding Ways. I have tried to get $0.25 just for putting in a promo code and it only took two seconds – it is a very easy way to get a little extra, but be aware that it will only be very little as they very rarely post these codes. You can earn rewards by inviting other people to join Rewarding Ways. As a member, you will get a link you can share with other people. If somebody joins through your link, you will get a small commission from Rewarding Ways every time that person take a survey or offer. It will not be something that will make the reward less for the person you invite, but a percentage paid by Rewarding Ways as a thanks to you for inviting that person. The commission on Rewarding Ways is pretty good, as you get 25%. It sounds like a lot, but remember that you will only make money this way if the person you invite uses the site actively. It can, however, be a nice way to make a little extra, if you know many people you can invite. Every 3 months, Rewarding Ways runs a cash contest, where the top 20 members will get a prize. The total prize is $1000. You can win really big prizes in the quarterly cash contest. The person that makes the most on the platform during that period will get an extra $350 and this decreases then until number 20 on the list that will get $10 extra. If you are an active member and take a lot of offers and surveys, this is a great extra prize to be able to win. But you need to be quite active to get into the top 20 and get close to this reward. However, compared to other GPT sites this is a very big reward and a great offer if you are an active member. Rewarding Ways on social media? Yes, Rewarding Ways is on social media, and you can follow them on Twitter. Some survey and GPT sites are really worth following on social media as they offer extra contests, codes, tips, etc. Rewarding Ways mostly use it as reminders about what the site offers or how much they have paid out to its members. They also post if new offer walls, survey partners, or similar has been introduced. It can be worth following Rewarding Ways on social media to find the promo codes. Most importantly, I think that it can be worth following them because it is on the social media channels you find the promo codes that can give you a bit of free cash. They are just not published very often as already mentioned so you have to be patient to find the codes. As you do surveys, task, watch videos etc. on Rewarding Ways, you will earn cash in dollars that you can mostly see in your Rewarding Ways account right away. Some options will earn you points instead. You can convert the points into cash. You can choose to have your cash paid out through PayPal, Skrill, or bitcoin. Your points you can get paid out as Amazon gift cards or convert them into cash. Some pretty great rewards in my opinion, but my personal favorite is to PayPal. Usually. you get the money transferred within a day after you request a payout, which is really nice. I have been paid by Rewarding Ways several times myself and it works really smooth and fast compared to many other sites. 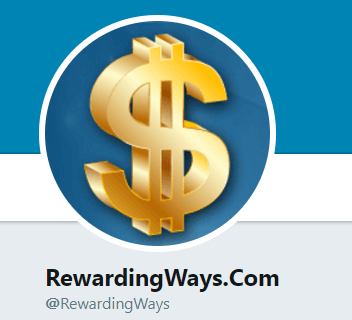 Rewarding Ways has a very low payout threshold, which means you do not have to make a lot of money before you can request a payout. Exactly how much you need to earn depends on the payout method you want to use. For PayPal and Skrill, the payout threshold is only $1, which is very low compared to many other similar sites. For bitcoin, you need a minimum of $40 to withdraw. Before getting your first payout, Rewarding Ways might request an address confirmation. How much money can you make on Rewarding Ways? As with any other GPT and survey site, this is more or less impossible to give an exact answer for. It depends on so many things and especially where you live, and how much time you are willing to spend. By looking at the top 20 earning members on the cash contest list on Rewarding Ways, it looks like you can make pretty decent money, and the top earners make between $400-$700 per month. I have, however, not made this amount on Rewarding Ways myself. To make this kind of money, you would have to spend a lot of time and be quite patient and you should not expect enough opportunities to make this kind of money if you do not live in an English-speaking country. But it definitely has potentials for some nice extra money. Just remember that GPT and survey sites will not make you rich or a full-time income, so do not join Rewarding Ways or any other similar site, if this is your goal. Rewarding Ways does not have an app. 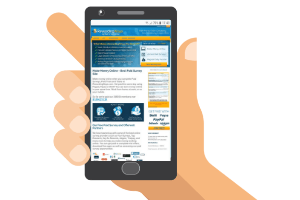 Many sites do not have that, but then have a website that is optimized for mobile devices, so it is still easy to use on a phone or tablet. That is not really the case for Rewarding Ways. You can use the site on your phone or tablet, but it is just not very well optimized for it. So it is very small and not very easy to navigate – especially on smaller phones. But it is possible to get used to and use on a phone, so you can still make money on the go with Rewarding Ways if you want to. It is, however, a lot easier to use it on bigger screens so you do not have to zoom in and out so much. Anyone can join Rewarding Ways as long as you are 18 years old. So it does not matter which country you live in. There can, however, be differences in the offers and amounts of surveys that are available depending on the country you live in. Be aware that if you move to another country or are on holiday and try to log in from another country than where you registered, your account can be flagged as a cheater. So if you go on holiday to another country, do not log in on Rewarding Ways, and if you move to another country, you should contact the support before you do. When you are logged in, you can submit a support ticket, if you need any help. Rewarding Ways says the support will get back to you within 24 hours. And in my experience with the company behind the site, you can expect an even faster reply. So great to know you can expect fast help if you run into any issues. Final verdict – Worth the rewards? As you can see from the above, Rewarding Ways is not a scam. In short, I would say that Rewarding Ways does have some potential. At first, it is not very user-friendly but with a little patience, it gives good opportunities to earn some extra cash. It is not one of my absolute favorite sites. But with patience, and if you live in a country where you are lucky that many of the surveys and offers are available, it can be a site worth joining. What I especially like about Rewarding Ways is the fast payout process, the payout methods, and the low payout threshold, so it is very easy and smooth to get your rewards. How to join Rewarding Ways? If you think Rewarding Ways sounds like a site for you, it is very fast and easy to join. You just click the button below, which will take you to the site, and you can sign up with your email. Once you have joined, you can start earning right away. If you have any questions, comments are have any experiences with Rewarding Ways yourself you would like to share, I would love to hear from you in a comment below. Rewarding Ways has a lot of options to earn and a very low payout threshold. At first, it can, however, be a bit confusing to use. With some patience to get to know to use it, it has many ways to earn, great payout options, very fast payout process, and responsive support. Therefore, it can definitely be a site to consider. Rewarding Ways do not have an app. So if you want to use it on your phone, you just simply open the website in the internet browser on your phone and then you can use it there. Thanks for sharing your experiences Marino. Have you tried to reach out to Rewarding Ways’ support about this? Because I have been paid out from them several times without any problems and have not had any problems being blocked. I know they are quite strict with security, so if you for example use a VPN or login from a different country than where you registered, they will block your account. So maybe try to ask them what is going on. You can see the country of people you refer, the date they joined, and how much you have earned from referring them. That is it. scam scam scam. I just joined used my card to complete offers. Also completed offers not requiring a card. I thought all was well, verified my phone number, clicked on withdraw cash, and they decided to keep my money now it says account verification required! Sorry to hear that Leticia. In the terms of Rewarding Ways, they do mention that they at any time can require address confirmation. So maybe it is not so bad, and you can just do the verification and then you will get your money. I would suggest to contact the Rewarding Ways’ support and ask them what you need to do to verify your account and get your money. Hopefully they will be able to solve it quickly for you. Usually the support is pretty fast at getting back to you. And fell free to keep me updated here. Would be great to hear how it turns out, and hope you will get your money soon. I definitely agree they could have handle it better and would have been nice, if they had told you what to do more clearly. No matter what, I think it would be good to contact their support, as I think there will still be a chance you can get your money. I have once been blocked by Superpay.me, which is owned by the same company and offers more or less the same. I was blocked complete, because I tried to login from a country, where I did not live. But after contacting the support, they quickly solved the issue for me, and I got access to my account and money again. So hopefully Rewarding Ways will have the same support and help you quickly.